For many years, Jean and Denis Matthews, owners of the M-Ranch at Sutton-in-Ashfield near Mansfield, worked tirelessly to raise money for local and national charities. Regular concerts were held on the immaculate Wurlitzer installed in the concert room adjacent to their home, and each Christmas their 'Fair Organ' would be taken around the streets - again raising money for various charities. 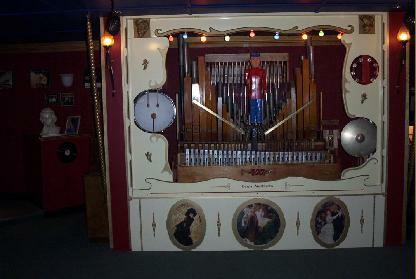 The Fair Organ was designed and built by Denis, with advice from Roy Bingham. It consisted of two ranks of Wurlitzer pipes - Flute and Trumpet, and also utilized a Wurlitzer Glockenspiel and set of chimes. A number of other percussion instruments complete the specification, together with a hand-carved band-master. The workings of the organ is based on a MIDI system, storing data on a floppy disc. The music was originally recorded onto disc from a small electronic organ. When Denis died, Jean eventually decided that she would sell the Wurlitzer organ, and also began to look for a home for the fairground organ. We were delighted to be asked if we would like the fair organ here at Burtey Fen. When the organ (complete with van) arrived in Pinchbeck in 2005, the organ had been unused for a number of years, and unfortunately water had leaked through the roof of the van causing everything to be very damp. As the van was beyond repair, Nick decided to remove the organ parts from the van and build a similar sized organ chamber on the balcony at Burtey Fen. This was to house the organ works, and gives the illusion that it is still inside a van. Every part of the instrument was removed, cleaned and repaired where necessary, and it was only a matter of weeks before the organ was playing again. The first improvement was to change the wiring system to work on standard MIDI files, which would enable the organ to play music specifically written for fairground organs. The organ now has ten tunes which can be played from disc, and is used during each interval at all the main concerts held at Burtey Fen. Further improvements are planned, including the addition of bass pipes, and one or two sets of violin pipes. We are most grateful to Jean Matthews for donating the organ to the Burtey Fen Collection, and know that it will give a great deal of pleasure to many visitors during the coming years.